Date with Disaster is centered around Batgirl’s attempts to set her father, Commissioner Jim Gordon, up on a blind date, but it also features a mystery and a more prominent role for Lois Lane…who has a few key things to say about the importance of the press. As Fontana reminds us, the idea of the press has evolved a lot from what it once was, and at times it requires a greater level of scrutiny. But the importance of a free and open press remains as strong as ever. “Freedom of the press has always been important, which is why it’s in the Constitution and is integral to free society,” she says. “But never before have people had so many news outlets at their fingertips, many of which have a loose relationship with facts. I think it’s especially important for kids to get a head start on understanding that you can turn a critical eye toward what you’re told by people in power and begin to think about why someone might want to manipulate the facts for their own good. 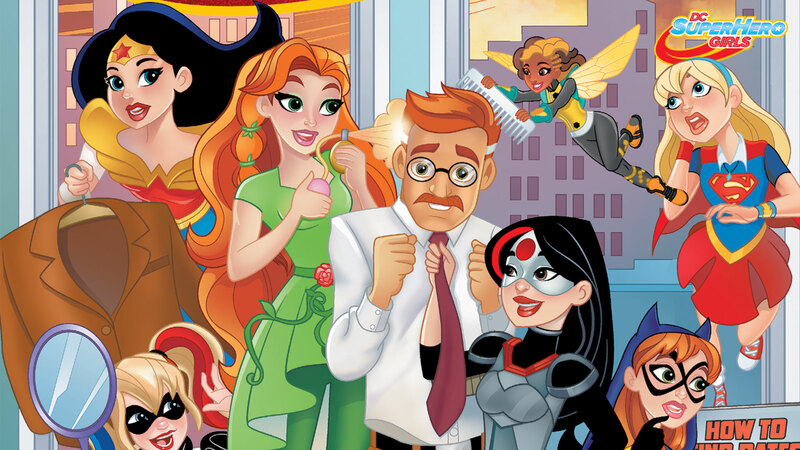 Many characters that classically make up The Daily Planet crew crop up in the world of DC Super Hero Girls for the first time in Date with Disaster to help the Supers investigate the larger mystery. Personally, I was delighted to see Ron Troupe return to the comic page after a too-long absence. He was one of the primary African-American members of The Daily Planet staff and a replacement for Clark Kent who wasn’t alive at the same time in publication history. It’s understandable that in the main continuity, where Clark Kent is back in action, it might be difficult to find a place for Troupe, so it was great to see him back and running The Daily Planet (albeit on a temporary basis), here. However, considering the story being told in Date with Disaster, there was a practical reason for Troupe’s return as well. Along with Ron Troupe, Date with Disaster also features a greater number of non-superpowered heroes in prominent roles. (Catwoman features pretty heavily in the story.) It’s a wise choice at this point in the DC Super Hero Girls’ evolution, considering the emphasis on superpowers found in many of the past graphic novels and movies. Lois Lane is such a perfect addition to DC Super Hero Girls that it’s actually surprising she wasn’t added to the main cast earlier. Lois, Ron and Jimmy learn that they work best as a team with ample trust between them and the Gordons learn that the love they share between them as a family is the most important of all. Date with Disaster ends with a happy reflection on the present and hopeful look to the future, which promises plenty more adventures for our favorite Super Hero Girls. DC SUPER HERO GIRLS: DATE WITH DISASTER by Shea Fontana and Yancey Labat is now available in print and as a digital download.